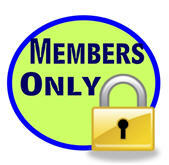 You are now logged into the member's only section of our web site. This section is for you to access information that will aid you in implementation of your Borrow Smart Compliance system. You will see navigation links on the left that are not available to public visitors to our web site. Of course, this information is not to be shared with anyone except those within your company.